I’ve been a huge fan of Jessica Durrant‘s illustrations for years. She occasionally posts short videos on Instagram showing her process, and I’ve always found it mesmerizing. I’ve also started watching videos from brilliant fashion designer and illustrator Zoe Hong. Ask any of my friends from high school, and they’ll tell you that fashion has not really ever been my expertise. But as I’ve been embracing and coaxing out my inner femme, I’ve become far more interested — if not in fashion on my body, then at least in rendering it. The thing is, though: I’ve never really painted. I’ve created 5 acrylic paintings in my life, all of which were done in college in 2007. I’ve drawn with markers and microns with some success. 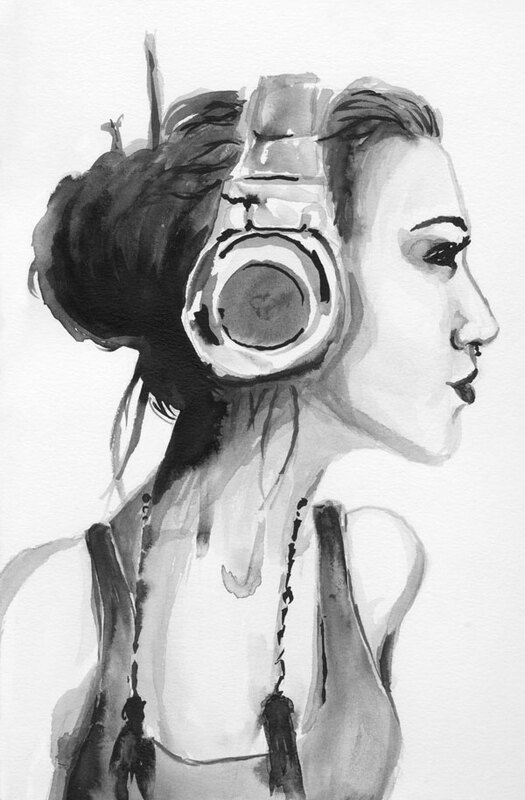 But as I’ve grown more interested in illustration and fashion, I’ve been studying Jessica Durrant’s work more and testing out how ink and water can work together. This was created using a stock photo from deviantART artist TwiggXstock as a reference. I used Dr. Ph. Martin’s India Ink (a mix of black and a tiny bit of purple, actually) in a fine-tipped Pentel Aquash water brush along with clean water in a medium-tipped Pentel Aquash water brush on Canson 140# cold-pressed watercolor paper (9×12). For my first real foray into ink/fashion-ish illustration, I’m pretty pleased — and really excited about what I may be able to do with some practice. Want to help me continue to create fine art pieces? Support me on Patreon! I try to give you free files every now and then as a thanks — and of course you can contact me about any of the reward tiers you choose to go with.